Sonifex are showing for the first time at AES-NY, on booth 549, their new Dante® commentary units, the AVN-CU2-DANTE for 2 commentators and the AVN-CU4-DANTE for up to 4 commentators. Using Dante® AoIP together with 4 wire connections they bridge the gap between old and new technology, allowing the ease of connectivity & functionality of AoIP together with the legacy connections needed to operate with the existing infrastructure in some stadia and sports grounds. Managing Director Marcus Brooke commented: "Our new Dante® commentary units have been beautifully designed and are smaller than the existing Sonifex CM-CU1 single 4-wire unit whilst packing in more features. The CU2 has a bright daylight RGB display split into multiple sections, allowing metering & control of up to 24 audio sources (inputs, outputs or mix-points) in 4 pages. Colour coded rotary encoders can be used to alter signal level and pan, with colours, sources & button functions all configurable using the web GUI. So it’s intuitive to use and can be configured for virtually any situation. We've added a mix-matrix to the unit meaning it’s incredibly flexible when mixing physical and AoIP sources to 4-wire & AoIP destinations." The 6 x push-button rotary encoders and 12 x key-cap buttons are fully configurable, to control input & output levels and panning. Each rotary encoder has a separate colour-coded meter section showing the channel name, detailed level metering, left/right panning and a limiter indication, on a bright daylight reading display. Colours can be programmed per encoder to quickly identify particular source groups, so headphone source selection becomes intuitive. Metering is available per input/output, with output metering configurable as pre or post level adjustment. The top of the display shows output metering, a limiter indication and the name of the output, a pre-defined logo or nothing. A limiter is available on every output. Four wire I/O on rear panel RJ45 connectors provide an AES3 or analogue input and output that can be assigned as mic outputs (line level), talkback outputs, programme inputs or talkback inputs as desired. In addition, the AES/analogue connections can be used as an insert or exit point into/out from the AoIP network. All of the buttons have key-cap text and can be configured. There are some standard operations available: on-air buttons can be used to connect mic audio to the main output, either over AoIP or via the AES digital audio connection. The on-air buttons can be locked if required. 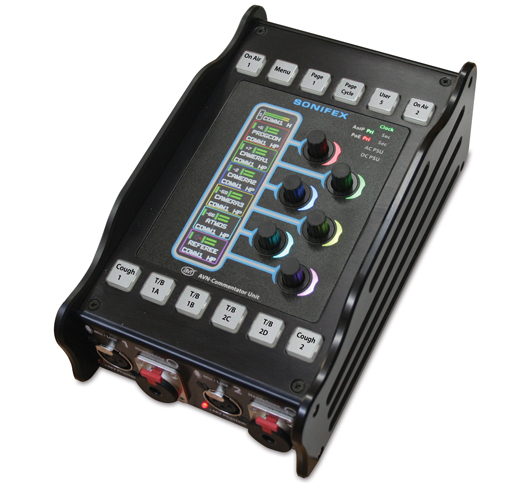 4 x talkback buttons can be configured to initiate talkback over AoIP or AES digital audio connection, using 4 x talkback busses. The talkback buttons operate with lazy talkback, taking the commentator off-air when invoked. There are 10 x configurable GPIO on a 15 way D-type connector with 1 x switched changeover output. The AVN-CU4-DANTE is a dual version of the AVN-CU2-DANTE providing four mic/line inputs with a wide, adjustable gain range and four stereo headphone outputs with lockable jack sockets, suitable for operation by three or four commentators. The featureset is as per the AVN-CU2-DANTE, with the following differences – it has a universal AC input, there are 4 x on-air buttons, 4 x page buttons, 4 x cough buttons, 8 x talkback buttons and 3 x user buttons. The units will be available Q1 2019.